Aussie Natural > Blog > Why do we have to drink water? Drinking enough water is crucial to a your health. However, unfortunately our thirst is not always a good indicator of sufficient fluid that our body needs. Nearly every system in your body relies on water, according to Mayo Clinic’s Functions of water in the body. The body cannot store water thus water intake must be replenished every day. Given this; inadequate consumption of fluids can lead to dehydration which occurs when your body does not have as much water as it needs to perform metabolic processes. Popular belief is that the body needs 6-8 glasses of water a day. However research conducted by Mayo Clinic ‘Water: How much should you drink every day?’ reveals that our needs cannot be categorised into one amount that fits all. In reality, our needs are influenced by multiple factors including health, daily activity, climate and environment. So, if there is no single formula and we cannot rely on thirst… how do we know if we are drinking enough? This may sound strange to some but the colour of urine is a good indication of the body’s water levels. 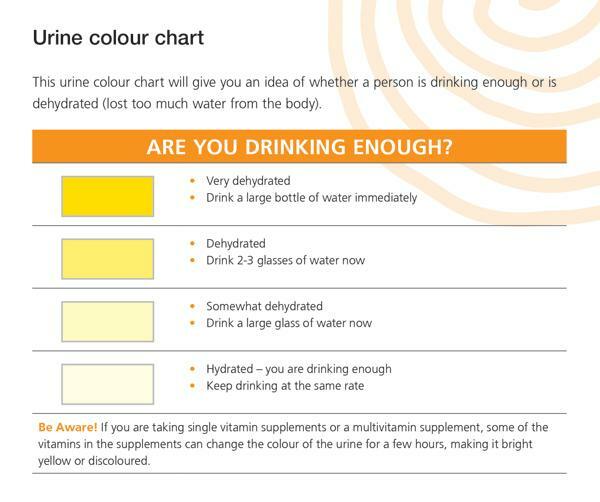 To assist with illustrating this, NSW Ministry of Health have created a Urine Colour Chart that displays different shades of urine to give you a good idea of whether you are hydrated. In addition to passing dark yellow urine there are other tell-tale signs of dehydration including lethargy, mood changes, slow responses and tiredness. How do I drink enough water? The best way to ensure that you’re drinking enough water and staying hydrated, is to continuously sip water throughout the day. That way your water levels never drop to dangerously low levels and you avoid the side-effects of dehydration. A great way to have easy access to water all day is to install a water cooler in your home or office. Having a water cooler gives you quick access to cold water, instantly! That was you can keep a glass of water on your desk and sip away! Aussie Natural has access to the the freshest and purest spring water in WA! Don’t miss out on nourishing your body with our delicious natural spring water! Our water coolers start from just $9/month and can be delivered for free throughout metro WA. Get a quote now, click here. Contact Aussie Natural today and get a water cooler for your office or home. You can’t put a price your health.